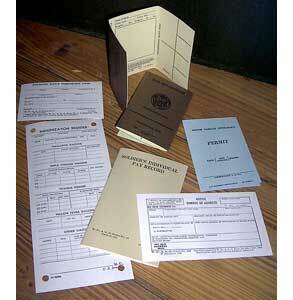 Reproduction examples of some paperwork carried by WW2 GIs. THERE ARE NOW WEB PRINTABLE VERSIONS OF NEARLY ALL PRINTED FORMS ON THIS SITE. Go to the Master List to see what's available. Typed forms can be produced by your unit clerk. There are scans of original examples of all paperwork. This will help you fill out your repro paperwork. Note that some forms were filled out using a typewriter while other times the same form was filled out by hand with an ink pen. How to cut out your paperwork! I use a cork-backed metal straight edge, and an X-Acto knife for cutting all my paperwork. The self-healing cutting board is available from Office Depot or most art supply stores. If you use a "normal" paper cutter(kinda like a guillotine), you'll cut off 1/2 your crop marks before you're done, making it quite difficult for you to cut them out correctly. When cutting your paperwork out, I'd recommend cutting the pieces along the red lines in the order labeled above. 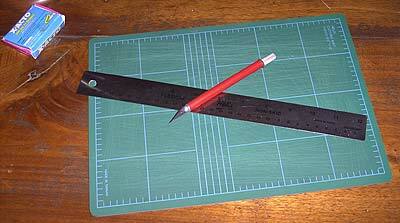 This keeps the page together until the last cut is made, allowing you to align your cuts properly on the crop marks. Remember to change your X-acto blades frequently. You'd be amazed how quickly they dull. If you're doing paperwork for your entire unit, buy the 100 pack, if you're doing stuff just for yourself, the 10 pack of blades should be fine.